I remember well those Saturday nights when none of my friends were around to have a sleepover. And then the middle school years when I was not cool enough to fit in with the rest. Val always soothed my sadness with homemade cupcakes while we watched an episode of the "Love Boat", and allowed me to stay up later than usual. Things always seemed better by the time Julie McCoy and Captain Stubing waived good-bye to all their weekly guests. Once Declan headed off with his friend and Rob went to work for the evening, Ava and I were on our own. The first movie we picked out didn't work which is a shame because I love any story that takes place in the American south and Ava has read "Because of Winn- Dixie" about a million times. But Ava found another one that was even better. 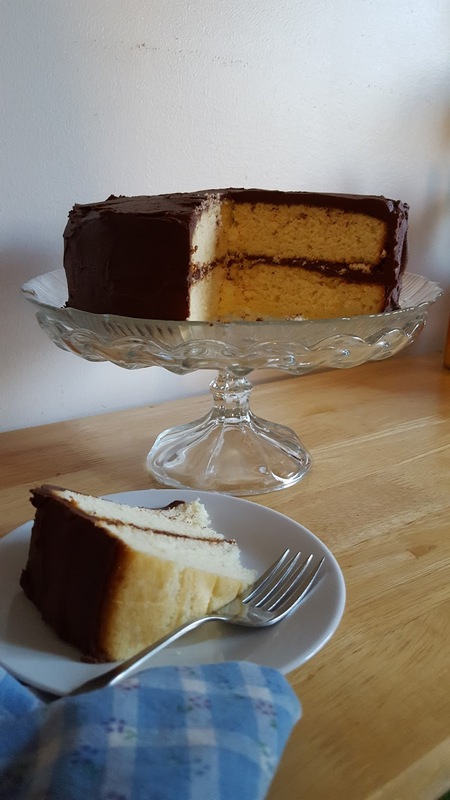 "Cinderella" was not scheduled to begin until 5:30pm which gave us plenty of time to mix up an old fashioned yellow layer cake (and lick the bowl, of course!) as well as concoct each our own plate of nachos, mine with salsa and pickled jalapenos, Ava kept hers clean with only cheddar cheese and sour cream. We devoured our personalized snacks instead of eating dinner with our feet up while watching Cinderella's sad fate unfold. The oven timer for the cake sounded just as Cinderella finished dancing with the prince. I had to keep Ava from sneaking a piece until it was cooled enough to frost and complete our masterpiece. This gave us plenty of time to watch all the maidens in the land try to wrestle a sweaty foot into the glass slipper. Everyone loves a happy ending: ours was found on the back of the Hershey's Cocoa can. During the closing credits, we whipped up the fudgiest of frostings and smeared it between the two layers of dense, homemade cake. We cleaned up after licking another bowl of sweetness and threw our pajamas on. Armed with large wedges of layer cake, we settled in to watch yet another maiden determine her own future. This time we only made it half way through "The Princess Diaries" and Julie Andrews' royal instruction to develop her American granddaughter into a regal swan. Ava was tired and ready for bed. It surprised me that she didn't want to push the limits by staying up to all hours of the night. She knows what she needs and what she wants because if you are a 12 year old girl in 2016, it's not only about being a beautiful princess but also about being strong and confident in yourself. Maybe a princess' view of life is different now, but not everything has changed since I was her age. There are still trials at school: algebra tests, annoying boys, catty girls and long bus rides home. 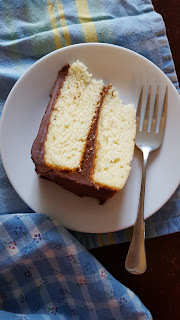 And no matter what is happening in life, the world is so much easier to bear when it is softened with a big slice of cake and a snuggle on the couch. Grease and lightly flour two 9x1 1/2 inch round baking pans and set aside. Combine flour, baking powder, and salt; set aside. In a large mixing bowl, beat butter on medium high speed for 30 seconds. Add sugar and vanilla. Add eggs, one at a time, beating 1 minute after each. Add dry mixture and buttermilk alternately, to beaten mixture, beating on low speed after each addition just until combined. Pour batter into prepared pans. Bake for 30 to 35 minutes or until a wooden pick comes out clean. Cool cakes in pans on wire racks for 10 minutes. Remove cakes from pans and continue to completely cool on wire racks. Frost with desired frosting.